In what has become a daily routine, a Friday report offers further information on Apple's rumored deal to buy Beats Electronics, this time saying the agreement has been delayed yet again as the two companies hammer out final details. 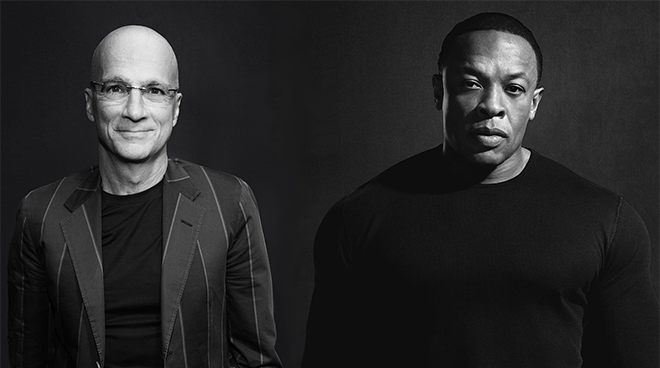 According to Billboard, there are five things that could potentially be holding up the widely rumored deal, including early leaks to the press, terms of the arrangement and questions regarding the future roles of Beats cofounders Jimmy Iovine and Dr. Dre. Citing sources familiar with the companies' ongoing discussions, the publication reports one problem is that the supposed $3.2 billion deal would be Apple's largest acquisition to date, also making it the biggest for CEO Tim Cook. Apple has officially bought Beats for $3 billion, making it the company's largest acquisition ever. Beats is best known for its premium headphones, but also recently launched a subscription music streaming service that was the key to Apple's interest. Another source claims details of the agreement leaked too soon. Apple is notoriously tight-lipped about future plans, but in this case the company was "nowhere near ready" for news to break, being in the middle of determining exactly what assets will be acquired in the deal. Third, a video posted to Tyrese Gibson's Facebook page shows the actor/model seemingly celebrating the alleged acquisition with Dr. Dre, whose real name is Andre Young. In it, Young proclaimed he would be the first billionaire in hip-hop. Another question that has been discussed ad nauseam over the past two weeks is how Iovine and Young fit into the equation. A report from The Wall Street Journal noted the two executives could land senior positions in Cupertino if a deal were to go through, but such an "acqui-hire" is not guaranteed. Finally, Billboard has heard deal terms regarding Beats Music, Beats' subscription-based streaming service, are hampering forward progress. The problem is reaching a proper valuation for the service, which could be a contentious issue given the involvement of backers like Warner Music Group. Friday's report merely adds fuel the rumor mill and curiously comes with a disclaimer noting the publication's sources were previously wrong in saying an Apple-Beats announcement would come this week, by Monday or "Tuesday at the latest." Billboard also floated reports that Beats cofounder Jimmy Iovine was in talks to join Apple as a special advisor to CEO Tim Cook, while running a think piece in which "Steve Jobs" biographer Walter Isaacson said the deal could be the future of Apple's television set aspirations. For what it's worth, the publication's sources are now saying a deal will indeed happen and that everything will be cleared up "next week."